One of the most unique aircraft ever produced, the Fieseler Fi-156 Storch was an aircraft built for a specific task of being able to take off and land in literally twice its own length. 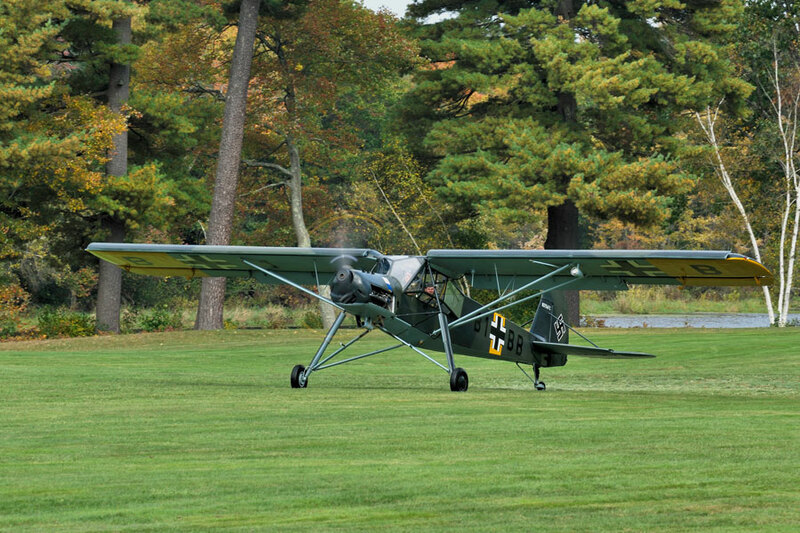 The Fieseler Storch, a german observation plane, is prepped for take-off at the 2009 Collings Foundation "Battle for the Airfield" Event. It was the fall of 1943 and the Axis Nations faced a serious problem. Benito Mussolini—deposed dictator of Fascist Italy– had been captured by the new allied government forces. The former dictator was held in a remote ski lodge built atop a 6,500-foot mountain that could only be reached by a narrow cable railway. The top of the mountain was strewn with boulders and a battalion of the new government’s troops guarded their former leader. Hitler had issued a personal command that Mussolini was to be recaptured and it was up to SS officer Otto Skorzeny to accomplish this task. After an airborne assault, ninety paratroopers and twenty commandos wrenched Mussolini from his captors. 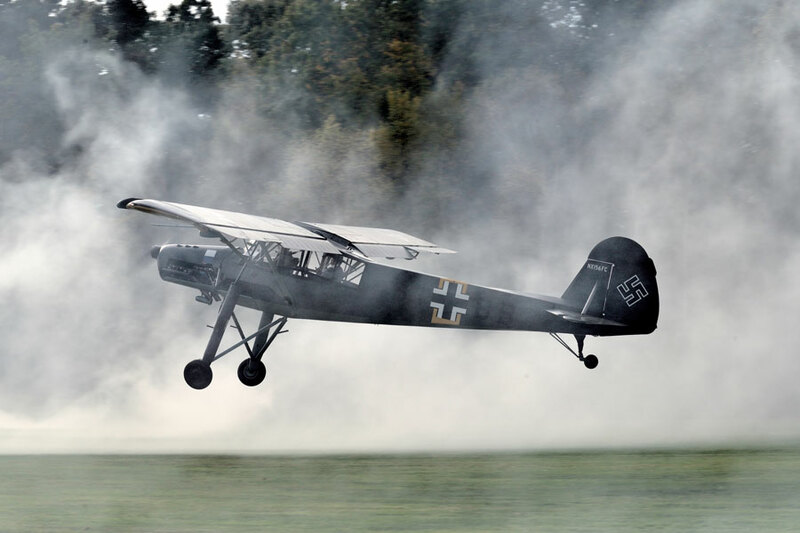 By now, the nationalist Italian troops had been notified of the attack and were swarming at the base of the mountain –the planned landing zone for the Fieseler FI-156 Storch sent to rescue the dictator. The only option available to Walter Gerlach, pilot of the Storch, was to land the plane on the rock-studded mountaintop that only had a flat surface of only 250 feet in any direction. Gerlach landed successfully in less than one hundred feet and then Mussolini and Skorzeny were loaded in the aircraft. Grossly overloaded, the Storch struggled to take off amongst the boulders on the mountaintop—one of which smashed its left main landing gear on the takeoff roll. Once in the air, the Fi-156 and its notorious occupants headed for German forces awaiting their arrival. This story is about just one of the many thousands of missions that Fieseler Storches accomplished throughout the deserts of North Africa, the battlefields of Russia, and throughout the rest of Europe during the Second World War. First designed in the mid-thirties from a trainer-touring design known as the F5, the Storch was really intended to be a civilian sport aircraft. However, it was not long before Germany became embroiled in World War Two, and almost all of the 2,900 Storchs built were put into military service. 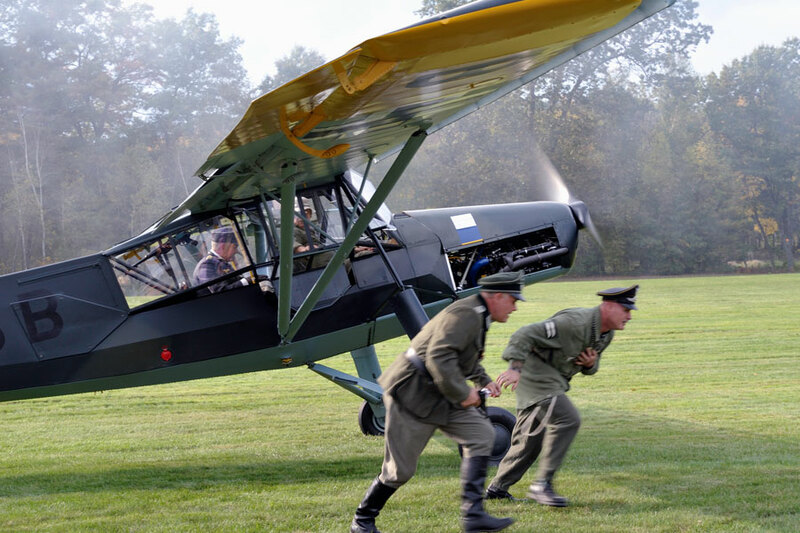 The truly remarkable aspect of the Storch was its ability to act as a short-take-off-and-landing aircraft (STOL). The FI-156 is capable of taking off in less than two hundred feet flying at 25 MPH and landing within fifty feet of touchdown. Such performance was made possible through the employment of large slats that were fixed to the leading edge of the wing and extending trailing edge flaps. The slats covered fifty-five percent of the wing’s leading edge, while the flaps added nearly forty percent to the total wing area. In service, the Storch was used in a wide variety of roles – serving as a reconnaissance platform, a liaison aircraft, for artillery spotting, and as an air ambulance. German commanders such as Field Marshals Erwin Rommel and Albert Kesselring used the Storches constantly for their personal transports during their campaigns. When the war was drawing to an end, a FI-156 was the last aircraft to land in Berlin as part of an attempt to evacuate Hitler—an offer he refused. After the war, Storches saw military service with the Spanish and Swedish Air Forces until the late 1950’s while wartime Czechoslovakian and French factories produced the aircraft for the civilian market. Today, it is a rare event when a Storch takes to the sky and it is estimated that less than a dozen war-production aircraft still survive. Of these survivors, the Collings Foundation is proud to fly its FI-156C as an example of one of the most versatile and amazing aircraft of all times.